Kara's Creative Place: Wild Kratts Birthday Party! Here is it the blog post you have all been waiting and searching for! There is no Wild Kratts merchandise on the market (I know, I've looked) so what is one supposed to do when your child wants a Wild Kratts Birthday Party??? Well you do it yourself! Cut black polar fleece for front part. 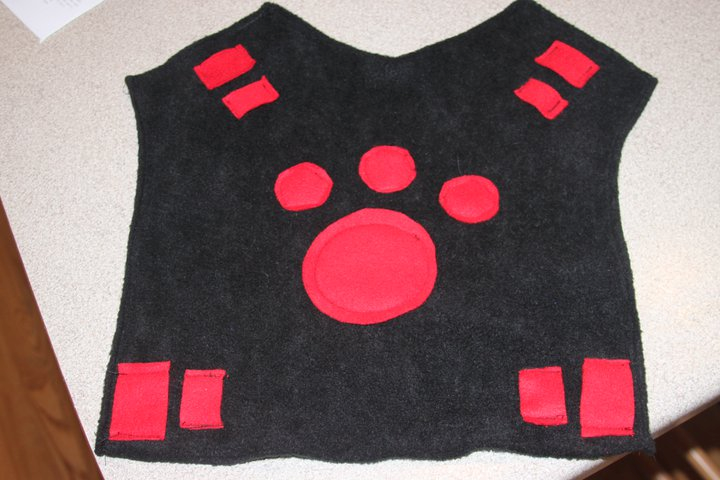 Add different colored paw prints and squares out of other polar fleece. One of our suits had T-shirt material for paw print. 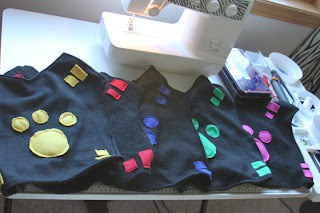 Neither polar fleece nor T-shirt material will fray so just pin it on top and sew around the outside to hold them in place. The suits are held on by elastic straps that criss-cross across their backs. So they put them on like a shirt. We played two games. 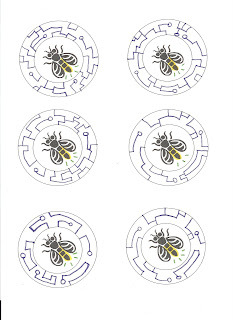 To earn Creature Power badges. Cheetah Tail Tag: Give each child a tail by tucking some ribbon or non stick plastic tape, found by caution tape in hardware stores, into the back of their pants. It needs to be someplace that it can easily be pulled off. All kids are "IT" in this game. Everyone tries to run around and pull off everyone's tails. Even if your tail is grabbed you can still keep playing and try to remove other's tails off. 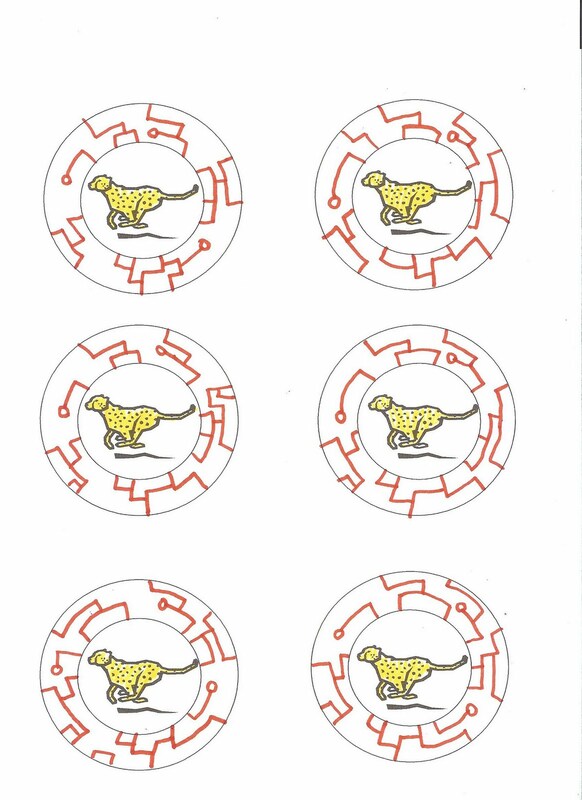 Fun Cheetah Facts:Cheetahs can run really fast and you will have to run fast in this game. Cheetahs have long tails that fly behind them when they run. They use their tails for balance when they change directions. After all that running everyone rested on the bench and had a Creature Power snack. What does a Cheetah like to eat? Other animals of course. 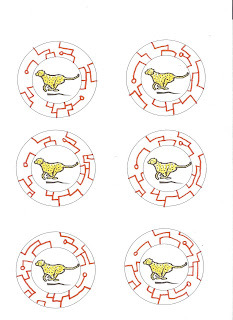 What did our Cheetah's eat? Animal Crackers of course! Firefly Says: Yep you guessed it is pretty much Simon Says. Except you say "firefly says". Firefly says.... flap your wings, fly in a circle, flash your lights by blinking your hands.. jump high... touch your toes... etc. If your fireflies do a good job they can earn their Firefly Creature Power Badge and our little fireflies also got their glow power with these battery operated glow sticks. My son's favorite!! Chocolate Pizza!!! I posted about it before here. This time I just added a creature paw print with frosting and spelled Wild Kratts on it. You can't really see my letters with all that yummy goodness in the way. Who cares it tasted awesome, and looks so colorful. It was a lot easier to haul this into the zoo then a cake as well. These photos may give you a clue! There are lots of creatures to discover at the Zoo! Disclaimer!! : I love that you are all excited about the Creature Power Suits, but I am not in the busness of making and selling them. Although I am flattered by your comments, I will not be making these for purchase for anyone.. I am not trying to be rude, I just don't have the time with three kiddos, to be sewing for others. The suits are super simple and if you know anyone who sews they will be able to make them for you, but that person cannot be me for any price. Where did you find the polar fleece to make the jackets? My son is also insisting on a Wild Kratts party this year! Love your ideas. I will probably use a few. We had some of the same ideas on things! That is adorable! I wish I'd been so creative a month ago... maybe we could have a themed playdate in the summer instead. My Son Wants The Red Wild Kratts Creature Power Suits Can I Buy the Red One From You. THIS. IS. AWESOME!!!! my kids love wild kratts, especially my son and this is awesome because he has been wanting more play clothes. he would absolutely love this!! thanks so much for the post! Thank you so much! I used your creature power templates and can't wait to play these great games at my son's birthday party next week. Thanks again! Your ideas are amazing. My son is addicted to Wild Kratts. Do you have the other creature templates available besides the tiger and firefly? this is soooo helpful! thank you for sharing! Thank you so much. My son wants a creature power suit for Halloween, so I will be making him one. Thanks for the great ideas! I need to make one of those cute creature power suits! Great ideas-- both my son and daughter want to be wild kratts for halloween- so this will come in very handy! Thank you SO much for this. Both of my sons want to be Chris and Martin for Halloween. I was a little stumped till I found your site. My boys will be so happy. You rock! Love it! We will be copying your ideas this Halloween--thank you so much for sharing!! Your party was so charming! Thanks so much for sharing your ideas. My boys want to be Chris & Martin for Halloween and I wasn't sure how to do it--easy and inexpensive idea! I am not crafty AT ALL - can I buy the blue Creature Power Suit from you??? What awesome tips! My son wants to be one for Halloween. You are now officially my Wild Kratts Maven! @Amber, my son wanted to be a Wild Kratt for Halloween, too, but settled for Green Lantern. 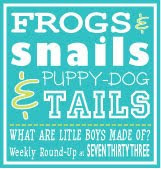 But these ideas will definitely help with his Dec. birthday party! Thank you for the inspiration, we made power suits for our boys for Halloween they are 6 and 3. 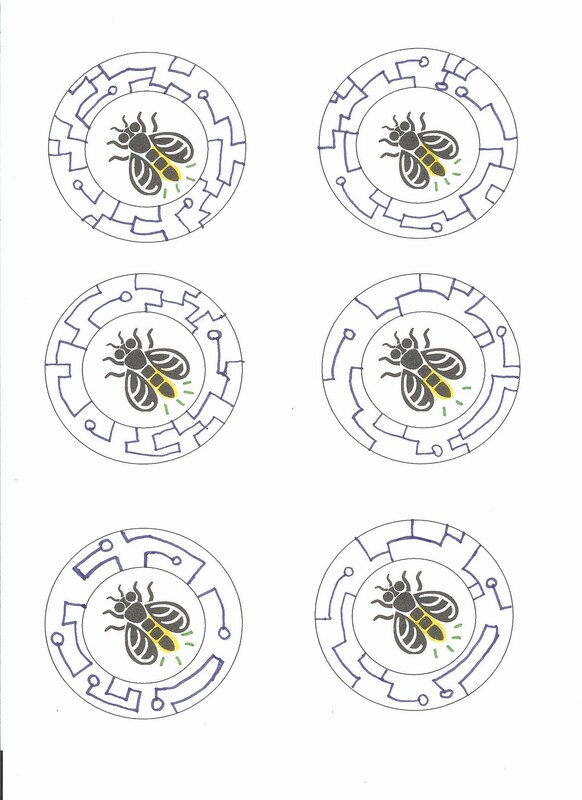 I could not find and power disks so I made a set of 8 in Photoshop. If anyone wants them drop me e-mail and I will send them. Awesome!! Thanks for sharing these!! Any chance I could hire you to make some power suits for a Feb bday party? as everyone else has said. thank you! WOW awesome! Thanks for sharing! OMG...some great ideas and I can see me using them next year for my son's 6th birthday. Can you make me some and I'll pay for them? My son would love them for a Christmas present. Please email me at woodard.andrae22@gmail.com if your willing and able to do this for me. THANKS!!! Thanks! My son has been asking for a creature power suit for Christmas! Yours are darling! I'm on my way to Joanne's! Those that want to buy these should check out etsy.com, you can make a request for anything to be made and etsy sellers can give you a bid. Yes, Etsy is the place to for that stuff! Some sellers now have the suits posted. This is a god send! Thank you!!! I am not crafty, but am always willing to try something. I can't sew, so does anyone know if hot glue or something would work to make the creature power suits? Maybe a t-shirt and t-shirt paint? Thanks for all your input! My son won't stop talking about the Wild Kratts, so this will help! Our kids would be great friends! Just last week, I was looking for an orca costume idea for my son's ocean parade at school. I pretty much copied the one you made. He loved it! This week, my 3 boys want creature power suits so I'm back at your blog! Looks like a great party! Thanks for all the inspiration! Yay! Love this idea! My son loves Wild Kratts and I was looking for a theme for his October birthday. Oh you rock!!!! My son is also a huge Wild Kratts fan and his birthday is coming up in October. Yay for ideas! Thank you! I'm kinda in love with your disclaimer. =) Good for you. check ebay if anyone wants to purchase..
What a fantastic idea! Thanks for the inspiration! !